The Huntington Library in San Marino, California, announced last week a batch of acquisitions at its Library Collectors’ Council meeting. Among the treasures is the Shrewsbury Miniature Prayer Book, dating from 1590, with its black silk velvet cover and gold champlevé decorative embellishment. (Champlevé is a type of enamelwork in which hollows in a metal surface are filled with colored enameled glass.) It is “as much an art object as a manuscript,” according to a Huntington statement. What this fine binding contains is also intriguing: a twenty-six-page crypto-Catholic manuscript of prayers, created at a time when England’s accepted religious doctrine was Protestantism. Those who continued to worship as Catholics did so at their own peril. “This book, although less than four inches in length, offers vital opportunities for studying the history of the book as an object, the crypto-Catholic lives of one of the most well-documented Elizabethan families, and the relationship between printed and manuscript prayer books during the Reformation,” said Wilkie. Images: Crypto-Catholic Shrewsbury miniature prayer book (c. 1590) manuscript in ink on parchment. Courtesy of The Huntington Library, Art Collections, and Botanical Gardens. 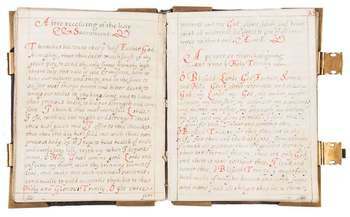 The Huntington Library in San Marino, California, announced last week a batch of acquisitions at its Library Collectors' Council meeting. Among the treasures is the Shrewsbury Miniature Prayer Book, dating from 1590, with its black silk velvet cover and gold champlevé decorative embellishment. (Champlevé is a type of enamelwork in which hollows in a metal surface are filled with colored enameled glass.) It is "as much an art object as a manuscript," according to a Huntington statement. 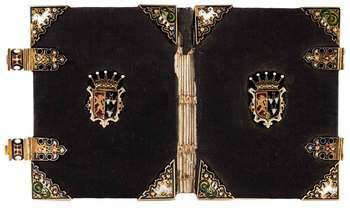 "The gleaming heraldic device on the front and back covers tells us that this riveting little volume was produced for Gilbert and Mary Talbot, the 7th Earl and Countess of Shrewsbury," said Vanessa Wilkie, William A. Moffett Curator of Medieval Manuscripts and British History at the Huntington. "The couple was a fixture in the Elizabethan and Jacobean courts, and their careers and scandalous reputations are well documented." What this fine binding contains is also intriguing: a twenty-six-page crypto-Catholic manuscript of prayers, created at a time when England's accepted religious doctrine was Protestantism. Those who continued to worship as Catholics did so at their own peril. "This book, although less than four inches in length, offers vital opportunities for studying the history of the book as an object, the crypto-Catholic lives of one of the most well-documented Elizabethan families, and the relationship between printed and manuscript prayer books during the Reformation," said Wilkie.